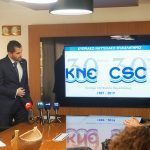 Taking the opportunity of the successful completion this year of 30 years since its establishment, the Cyprus Shipping Chamber organised a Press Conference on Friday, 25 January 2019, at the Chamber’s recently renovated office in Limassol, during which, a short presentation was made on the various events that the Chamber will organise during the year. 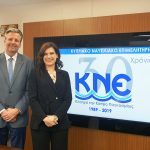 A courtesy meeting followed by the Shipping Deputy Minister, Mrs. Natasa Pilides along with other officials of the Deputy Ministry and Members of the Shipping Chamber. The Cyprus Shipping Chamber was established on 26 January 1989, and constitutes the trade association of the Shipping Industry in Cyprus. The main purpose of the Chamber is to promote the interests of Cyprus Shipping and to continuously further the reputation of the Cyprus flag. 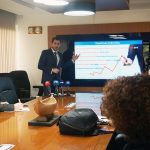 At the same time, the Chamber acts as a lobbying group for the promotion and safeguarding of the legitimate interests of its Member-companies, at a national as well as at international level. 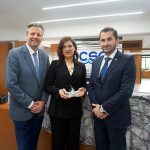 Today, the Cyprus Shipping Chamber ranks as one of the largest national shipping associations in the world and undoubtedly, “Navigates Cyprus Worldwide”. The Shipping Chamber in view of this year, which is a landmark in its long history and multifaceted contribution to the Cyprus Shipping, Economy and Society in general, will host various business, social and charity events, which are expected to attract significant local and international shipping professionals, highlighting both the recognition that the Cyprus Shipping enjoys on a local and global scale and the significant contribution of the Cyprus Shipping Industry to Cyprus Economy and Society, which remains united and faithful to Cyprus and the Cyprus flag, as it has done for decades now.